Its 9.54am Thursday 24th September 2009, as I write / wrote this post: Usually it takes a while for the Responses to my Campaign letter I regularly have sent to No 10 and Gordon Brown, to come back. I have sent the correspondents seven times in total so far. Most recent compiled 16th September and Sent recorded delivery first class on the 17th September. I have received a few varying responses. Like deferring responsibility, Trying to get me to not write by saying it has been documented nothing more they can do. The last response apart from this most recent one even reacting with a slight attitude that they have had to write in response at all. Baring in mind it is the Direct Communications Unit that pass it on to them. Something I have pointed out recently. But this morning with sadness and a heavy heart holding back the tears (so far though they flow inside whether you admit it or not) I have already in real quick time received a response. Oh NOT from The Prime Minister of course but The Direct Communications Unit. I feel this is enough for now for those who care to see. I thought it was appropriate to start a new page with this on its own for now. And to have just as much a quick response in showing others this latest ? ? ? ? Just must add one more thing right now. I've had enough, I'm tired hurt upset angry and more oh yes more. We can petition and March all we want and yes they are things we should and need to do. But none of it will really change until we get enough people with genuine decency in high places like Government THAT WILL ACTUALLY DO SOMETHING ABOUT IT. What did I do next? What should your response to it all be? having our voice, at the Stop Child Abuse Now Rally 2009 (see below video). Sent by recorded delivery 15th February 2010. One miss spelling slipped through but has been corrected here. As promised I again resend you this correspondence for a FULL and PROPER response from YOU. And I will continue to do so until that happens, and until a proper Investigation is done. So that all those involved are brought to account, made accountable, punished or dismissed, whatever the Facts shows need to be done. And for changes to be put in place so we are protected and this is enforced, enforceable and until there is a willingness to do so. I have to say that again. Also please be aware of five replies I have received from Government Departments on YOUR behalf (enclosed). I respond to you below briefly about them. The second DCSF reply I received was, dismissive of responsibility at the very least. The third DCSF reply was dismissive of responsibility as before and clearly shows what we are up against. Noting that clearly they either haven?t read the letter or are just plain ignoring the PAIN STAKING FACTS literally involved in my case, which I bring to you all. The fact that the DCSF suggests that I go back to, GP?s, Healthcare Bodies and other organizations for help and support, when they are the very bodies I am writing to you about beggars belief. And it is an affront to my suffering and an utmost disrespect to people in my situation. Be aware Prime Minister it is YOU and YOUR GOVERNMENT and DEPARTMENTS that need to listen to US. Not only do you all clearly not know what is really going on, said with hope?But you are unwilling to hear the truth to do what YOU all are here and paid for to do. And about the very things that makes your job so important, and when failures to do so has such disastrous effects on us, which I have told you about. The fourth response was from The Department of Health and I quote from it "After considering your letter, we have forwarded your correspondence to colleagues in the Department for Children, Schools and Families where the staff are better able to answer your concerns." Now though I know this is partly true with regards to some issues involved. You can?t help but wonder how this lie?s with the fact that contained in your letter, is direct information about Healthcare Professionals in my case. That is something that is The Department of Health?s concerns?or should I say? should be Prime Minister. The Fifth Response from the DCSF was as above, plus a slight attitude. The DCSF should take out their frustration on No 10?s Direct Communications Unit, and not me and my Legal right? to be heard. The 18th December 2008, The 31st January 2009, 4th March 2009, 30th April 2009, 4th July 2009 and 16th September 2009. 1) Main letter which was also originally sent to David Cameron (Conservative) and Nick Clegg (Liberal Democrat) as well as you. Below correspondences added from 4th March 2009 onwards. 3) Sixteen Pages from My Medical Records and Book I created. I am not just making this all up or not all there. Maybe now you will see what I am saying some you can see for yourself. And most importantly, what I can prove. 4) An email sent to The Law Society, among others, sent before and since. I AM NO LONGER WAITING TO HEAR FROM ANY LEGAL REPRESENTATIVE NOW. Before that is used by someone as yet again an excuse to not respond shamefully. Below correspondences added from 4th July 2009 onwards. Below correspondences added from 12th February 2010 onwards. 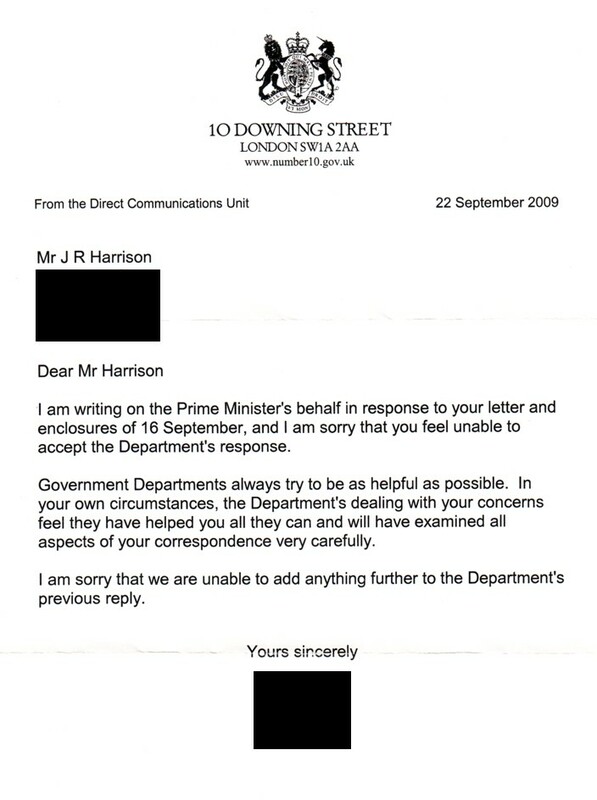 8) Last 10 Downing Street direct communications reply. 9) Reply from Her Majesty the Queens representative. 10) DVD containing all seven previous correspondents? to you. 11) DVD containing the ?PM? video and audio of me speaking at the ?Stop Child Abuse Now Rally and March 2009?, also available on my website, YouTube and other Media outlets. Please note, when I tell you about the Abuse, Neglect I have suffered, and are suffering, from within the system. Your Government say?s it?s been noted and do nothing else. In so doing YOU are condoning "what they have done", "are doing" and "will do". I will not allow this to continue unopposed. The last decade and more clearly shows this kind of attitude and I will expose it in a very simple way for all to see. As I have said to you before I have copied all this information of the seven Hundred documents (plus) that I have, in case something happens to me, in any event. And others have seen and are aware of these documents that I talk of. All information contained in letters to you and others are Provable Undeniable Facts (a brief sample I have enclosed to show this). I will not be Ignored, Silent or Silenced. My voice, our voice will drown out the silence and denials. In 2009 I wrote to Her Majesty the Queen and three other members of the royal family. I did receive two responses including one from a representative of Her Majesty the Queen, included in this correspondence. I mentioned in my last correspondence to you that I had also written to The BBC and Spoken to someone on the phone, wanting to expose all that I have written to you about. I also stated I would be looking at all the ways I can expose the failings I talk of, including the use of other mediums. And since the last correspondence of September 2009, I have successfully used other forms of media to Highlight my case, and expose the failings of those involved to respond, let alone act. All of which in due course you and others will be made fully aware of. One of those ways, since you have failed personally Prime Minister, is that on the 26th September 2009 I with others attended the ?Stop Child Abuse Now, Rally and March? in London. The open forum was held in Parliament Square, where I read out five of my Poems, audio of this is included on a disc provided with this letter. Last year I also started to air my cause through Radio. And since November of that year I have been on the radio six times, including an interview I did that lasted for about half an hour. In 2010 I have published my book ?Whispers from Within?. And More Radio and other things are planned in 2010 and beyond to achieve all that I want to achieve, with others too. We are continually failed by all those I spoke of in my email to The Law Society. And no matter how crazy it all sounds, it?s the facts. We have nowhere to go, nowhere to turn to. We are and have come to the top. And we are not going anywhere until this is done. We?ve been there, done it and got the T Shirt, to no avail. This must be exposed, and this must change. My existence as others is ready to be used to this end. So that others are not continuously failed by you and others always. I have nothing else to be here for. As I have said before. I cannot take it all away. I cannot change it. But I do everything I can to make sure, that it?s not all for nothing. Ignore me, use excuses all you want. But, you will have to face the truth, our truth and the part you all play in it. The real situation of how it really is for us will be signed like a signature with my existence as others. Ready for the many when they are strong enough to sign it with theirs too. Do not continue to condone what has been done, is being done and will be done, because of failures to act. Either way I will expose this for all to see. We fight for True Accountability for one and all, brought about by the loud silence that echoes this great country? with great shame. Use this link to see the reply I got from Her Majesty the Queens representative. Well after the... OK lets leave that, anyway we have a new Prime Minister and Deputy Prime Minister, David Cameron and Nick Clegg, a new Government BUT let me add. The original PM letter was sent to both of them and five other parties. DONT FORGET that they, not only did no better in responses than Gordon Brown. THEY BOTH did not even reply, nor anyone on their behalf in April 2008 when I first sent the original letter to them. So before anyone says anything, I will be reminding them of that. AND it is very important to note, that when they (someone representing them) did reply, the Liberals only acknowledged the letter, very poor. While the Conservatives, within the acknowledgement, sent a seven paged typed up speech that David Cameron had made. Yet it contained nothing at all about Child Abuse, no mention of it, TOTALLY UNACCEPTABLE David. You both have nothing to be proud of, nor your parties, or your lack of respect for the issues shown to me by ALL parties. Seven parties where sent the letter on top of the then Prime Minister Gordon Brown. The follow up letter was also sent to David Cameron and Nick Clegg too, of which contains the main bulk of the other letters (now totalling eight) sent since. But what now? 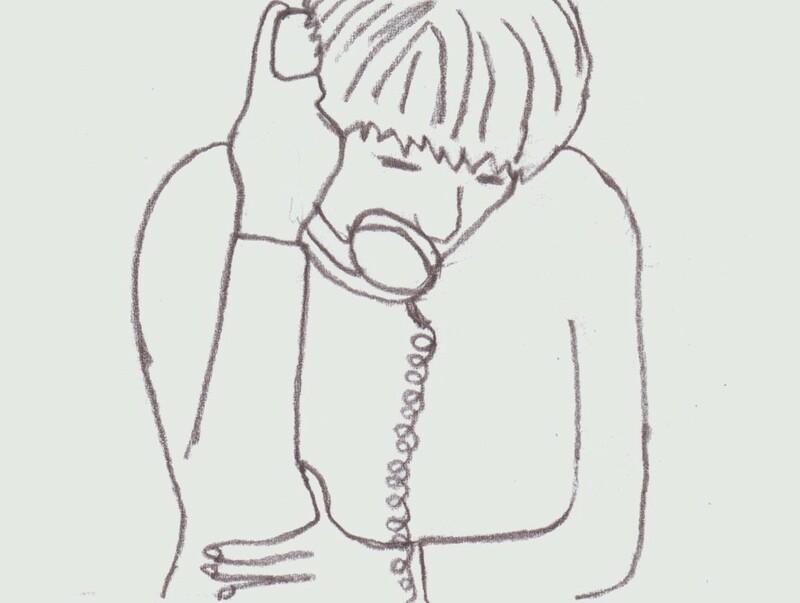 I continue raising awareness of all the issues, and what others did or did not do when I contacted them. Holding them to account.